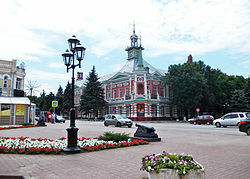 Azov (Roushie: Азов) is a toun in Rostov Oblast, Roushie, situatit on the Don River juist 16 kilometers (9.9 mi) frae the Sea o Azov, which derives its name frae the toun. Population: 82,937 (2010 Census); 82,090 (2002 Census); 80,297 (1989 Census). ↑ Энциклопедия Города России. Moscow: Большая Российская Энциклопедия. 2003. p. 14. ISBN 5-7107-7399-9. ↑ 3.0 3.1 Roushie Federal State Stateestics Service (2011). "Всероссийская перепись населения 2010 года. Том 1" [2010 Aw-Roushie Population Census, vol. 1]. Всероссийская перепись населения 2010 года (2010 Aw-Roushie Population Census) (in Roushie). Federal State Stateestics Service. Retrieved June 29, 2012. This page wis last eeditit on 8 Mairch 2018, at 06:38.